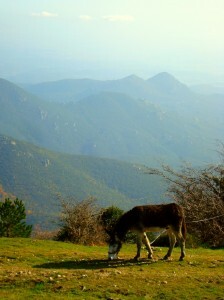 Family friendly hiking with donkeys in the wilderness, a special holiday! A guided donkey tour. Fancy an adventure? Desire pure nature? Ready to exchange the convenience of civilization against the luxury of the simple life midst unspoiled nature? Eagerly awaiting romantically adventurous experiences? Then the Albera-Mountain-Trail is just right for you. 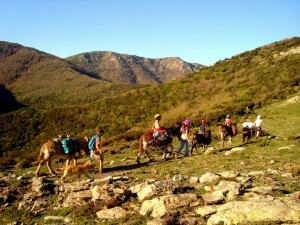 The pack donkey trekking takes you through the Albera nature park up to its highest peak, Puig Neulos (1250 m). You cannot experience any more freedom! A breathtaking panorama – reaching from the Pyrenees to the Mediterranean to Spain and France – imprint themselves an unforgettable moment. The combined beauty of our area is shown from up here on a “panoramic view “. Mediterranean maquis, mystical cork and beech forests, alpine meadows, dolmen, menhir and medieval castles provide magnificent, Mediterranean scenery. 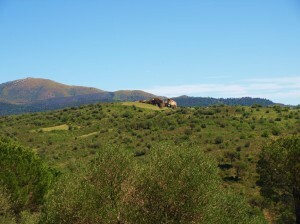 This is the real Catalonia, which – not far from the sea and beach – extends into the interior. The sunrise over the sea, the fragrant air, the rippling crystal clear streams, always side by side with the donkey, who faithfully accompanies you: We don’t promise a special experience, we know it is! The Albera-Mountain-Tour is suitable for adults and families with migrant joyful children who want to enjoy their holidays in a very special way. 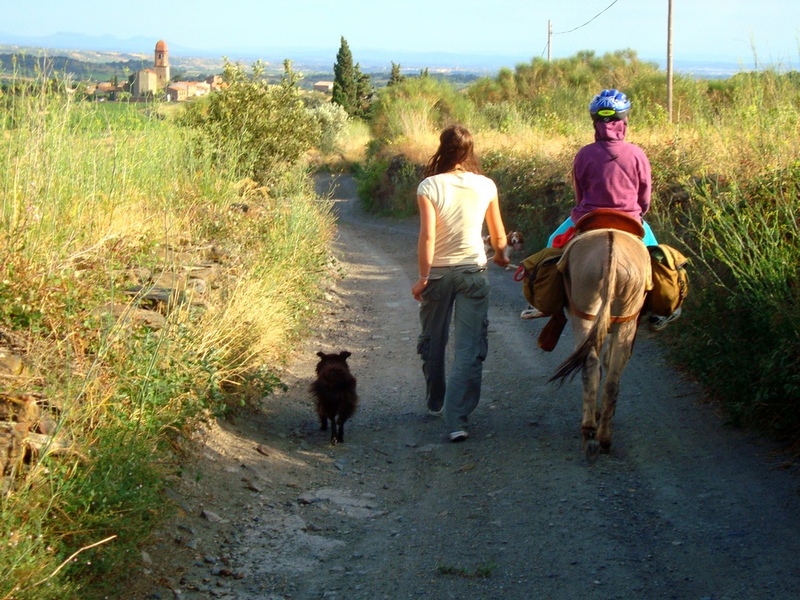 With the donkeys we walk through secluded forest paths, and on narrow forest and hiking trails. On this donkey tour there are always parts of the route on which the small children can ride the donkeys. 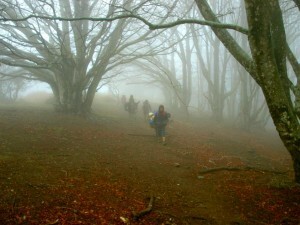 All in all, this trek is a wonderful nature experience for the whole family! Ideally, the donkey trekking tour is followed by a seaside holiday. We start our adventure near the village Espolla. Here we meet our donkeys and learn how to handle them properly. 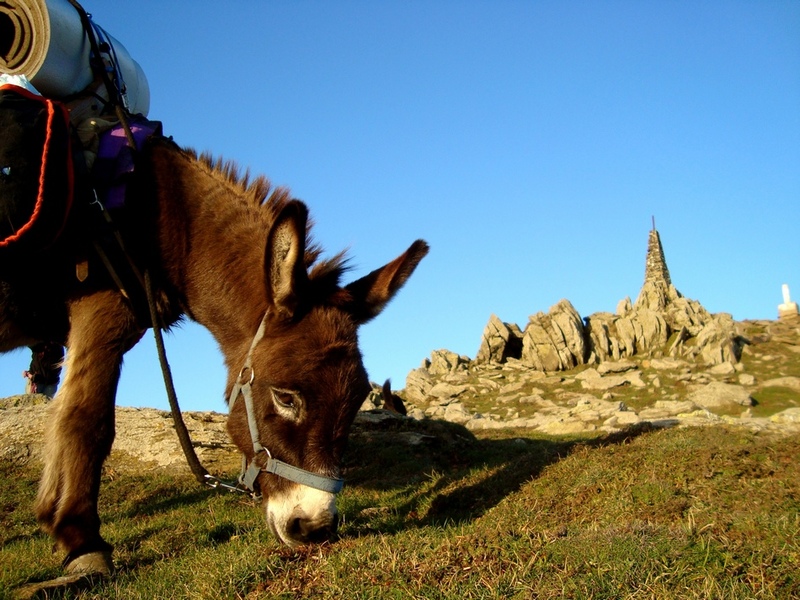 The aim is to know how to properly care for the donkey and how to pack it, because they should also feel fine during the hike. 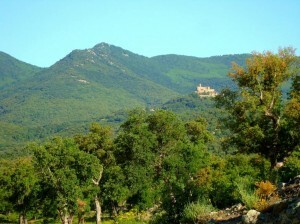 At a leisurely pace we walk slightly uphill to the medieval castle Requesens, a seemingly impregnable castle on a hill. An impressive sight! We pass through a cork oak forest and walk past the impressive formations of granite stone. This landscape is unique and exudes an almost mystical spell. We take a break by a small river and bathe in its delightfully cool water. With the “new energy” we continue until we reach our quarters for the night, a unarden mountain hut behind the castel of Requesens. With views of the castle, we set up our tent and feel like the knights of the past…. Day 2 – Off to the mountain! After a hearty breakfast we are ready for the mountain. Our trail leads us further up through beech and chestnut forests. Step by step we arrive to a pass below the summit. The pass forms the border between France and Spain! Here on an alpine meadow, high on the ridge, it is just too inviting for a rest and we get rewarded with a magnificent view. On the French side, we descend again until we reach the Gîte d’Etape les Alberes, our accommodation on the Pass Coll d’Ullat. Today we enjoy the soft bed and the cooked dinner. 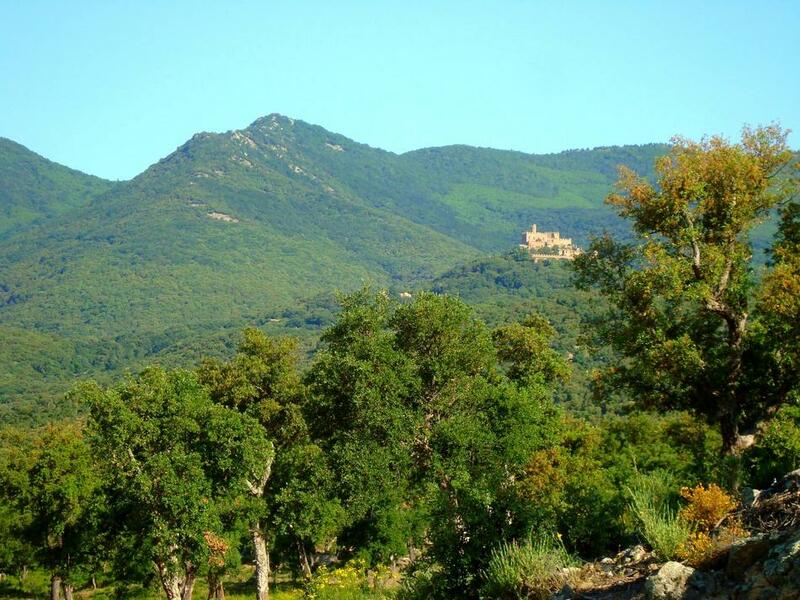 With the wonderful view of the French coast and mountain scenery, we end the day. With packed saddlebags on the donkeys we start uphill again. The summit of the Albera mountain range, the Puig Neulos (1250 m above sea level) is our first destination today. Up here we have a 360 ° panorama. Mediterranean and the Pyrenees, as far as the eye can see! We continue along the ridge of the mountain, over beautiful mountain meadows and through magical beech forests with ancient trees. On the way, we meet some native Albera cows, who enjoy an almost wild life. At the end of today’s trek, we reach on the north side of the mountain the hidden hirtmans hut of Colomates, which provides shelter for the night. An idyllic place that invites you to linger. Far away from stress and civilization. Only the rippling of the river and the singing birds can be heard. Pure nature! A new day dawns. Breakfast, packing, cleaning, saddling and loading, … ready for the onward journey! First, we go a part back on the way which we came, until we reach the pass, here a path leads us down again on the south side of the mountain. On a mountain saddle we feel again like a bird, with sight as far as the eye can see. Shortly after that, we reach the ruins of an abandoned hamlet. Nearby we hear a rippling river with clear mountain water. What a wonderful place to spend the night! What’s better than listening to the owls in the moonlight under the starry sky and slowly sinking into the dreamland! Today is our last day! 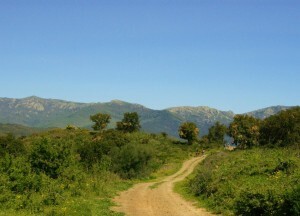 We walk down, the landscape becomes Mediterranean and the spicy scent of wild herbs accompanies us on our way. Along the way we see the Empordà plane and the Gulf of Roses. 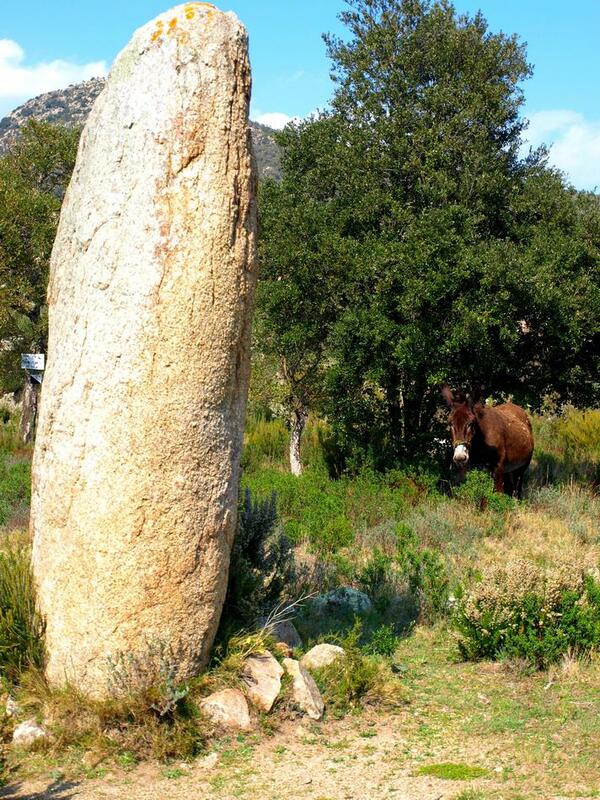 To the left and right of the trail you will find hidden between bushes and cork oaks, another 6000 year old dolmens. Finally, on a historic path between stone walls, we return to civilization, in the hamlet Els Vilars. With some sadness we take on the last kilometers to espolla Here we end the trail and we have to say goodbye to our loyal, friendly companions! Adios Amigos! In Garriguella, where our donkeys live, the hike begins. About 15 kilometers behind us, the Mediterranean Sea. In front of us our destination, the Sierra de l’Albera. From here, to the west, the Pyrenees extend, on the horizon we see the summits almost 3000 meters above sea level. 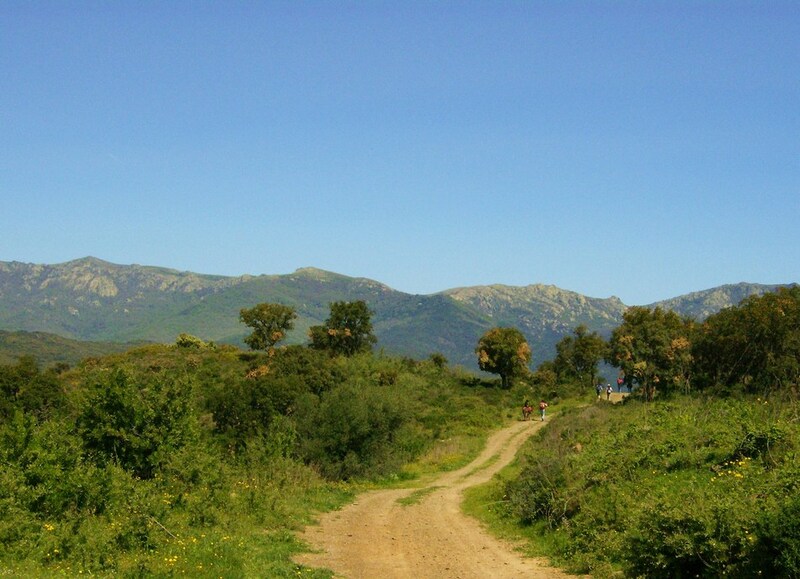 The hike takes us through the wine growing area of ​​Empordà. 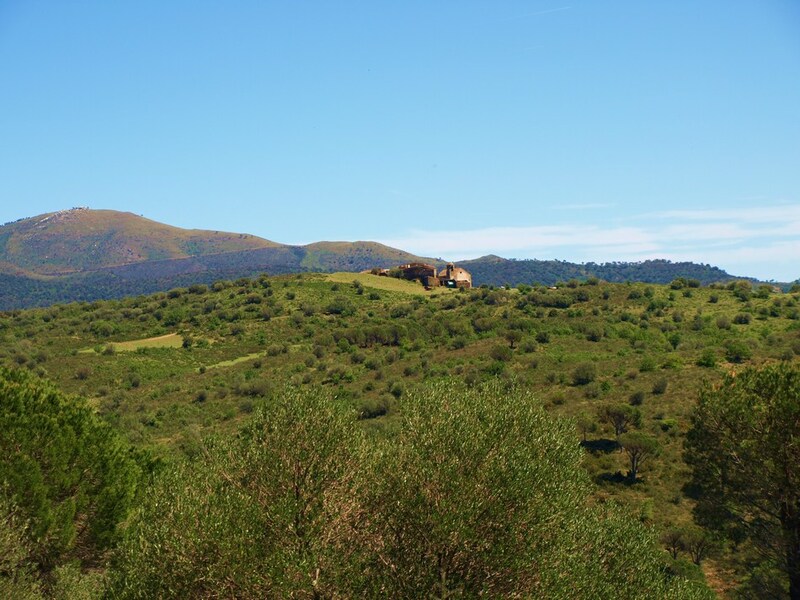 Between olivegroves, vineyards and through Mediterranean landscape we reach Mollet de Peralada, a small village. From here we finally reach Sant Climent Sescebes where we can spend the night in a cozy accommodation in the middle of the village. After a hearty breakfast in the accommodation in Espolla, we load our dnkeysand set out for the final stage. The landscape is again very Mediterranean, on the one hand there are the centuries-old olive groves, on the other hand, the wild bush landscape that characterize the image to Garriguella. On the way we pass through the picturesque village of Rabós. Here we meander through the narrow streets and cross over an old stone bridge the river Orlina. Under the stone bridge, not only the native turtles sunbathe, when the weather is nice, we also can enjoy a wonderful bath. All in all a wonderful last day of hiking! – The tour can be run in both directions. – On the tour it is important to inform yourself about the weather conditions. In very bad weather, route changes can be necessary. – On most days it is only possible to fill up the bottles with drinking water once, so you have to carry enough water bottles. A water filter or tablets are usefull. – Please specify when booking the accommodations that you will do a donkey trekking with Burrotrek.